Twenty years ago the Cincinnati Reds won their fifth World Series beating Tony La Russa's Oakland Athletics in a four game sweep. WhackReds.com is celebrating the 20th anniversary of the Reds' last World Championship, and the 2010 season, by dissecting each aspect of the respective teams. First base this season is owned by Joey Votto, but before the 1990 season began the Reds had two players fighting for the position. Hal Morris and Todd Benzinger went into Spring Training 1990, both having the same intentions to start the season at first base. Benzinger got the nod, but during the regular season they split the time at first virtually in half (Benzinger started 82 games at first and 8 in the outfield while Morris started 80 games at first and 6 in the outfield). Both Benzinger and Morris helped propel Cincinnati to the post-season in 1990, but due to Morris' longevity with the Reds, career accomplishments, and flat out awesome haircut, we're marking him down as the the 1990 Reds first baseman. William Harold Morris III was born on April 9th, 1965 in Fort Rucker, Alabama. During High School in Munster, Indiana, Morris was selected Player of the Year. Morris then attended the University of Michigan. While at Michigan Morris played with two future Reds teammates. Barry Larkin, Chris Sabo, and Hal Morris led the Wolverines to a College World Series appearance in 1983 posting a 33-0 regular season record. In 1986 Morris was selected in the eighth round of the amateur draft by the New York Yankees. During his two seasons with the Yankees ('88-'89), Morris was used primarily off the bench starting only seven games. Morris was traded by the Yankees to the Cincinnati Reds after the 1989 season for Tim Leary and Van Snider. Hal Morris began his career as a Cincinnati Red in 1990. While compiling at-bats playing first, roaming the outfield, and coming off the bench to face right-handed pitchers, Morris put together an impressive .340 batting average as he appeared in 107 games during the 1990 season. His versatility undoubtedly helped push his team into the post season, and during the NLCS against the Pirates Morris batted .417 going 5-12. Although he helped to get his team to the World Series, Morris didn't do much to help them win it. In 14 at-bats Morris only managed to get one hit. In game 4 though, Morris hit a sacrifice fly, scoring Herm Winningham, that ended up being the winning run securing the Cincinnati Reds' 1990 World Championship. In 1991 Morris (.318) finished just one point behind Atlanta's Terry Pendleton (.319) for the National League Hitting Crown. Playing for Cincinnati, Kansas City, Toronto, and Detroit Morris continued his professional baseball career until 2000 and posted a .304 lifetime batting average. Hal Morris is currently a scout for the Pittsburgh Pirates. Joseph Daniel Votto was born on September 10, 1983 in Toronto, Canada. Votto was drafted in the second round (44th overall) of the 2002 MLB draft. Struggling to to make a name for himself in the Reds' organization after average performances in '02 -'03 with Billings and Dayton, Votto emerged as a force during his '04 season. Spending time in Dayton and Potomac, Votto hit a combined .301 in 135 games (33 doubles, 92 RBI, and 19 HR). In 2005 he was promoted to Sarasota, but his numbers declined. His batting average dropped nearly fifty points (.256) as he struck out 122 times. In 2006 though, Votto was routinely moved to AA Chattanooga, made his adjustments, and started putting up undeniable stats. He batted .319 with 46 doubles, 22 HR, and 24 stolen bases during his '06 season leading the Southern League in average and total bases and was third in home runs and RBI. Votto was selected to play in the '06 Futures Game, Mid and Post-Season Southern League All-Star games, and was voted a minor league All-Star by Baseball America. His final acclaim to his 2006 season was winning the prestigious Southern League MVP award. After his career year in '06, Votto spent a majority of Spring Training 2007 with the Cincinnati Reds and made the 40 man roster, but was sent down to AAA Louisville to begin the season. He played 133 with Louisville in '07 modestly batting .294 with 21 doubles, 22 HR, 92 RBI, and was named the International League's 2007 Rookie of the Year. On September 1st, 2007 Votto's talent could no longer be denied as he was finally called up to the big league club and made his major league debut on September 4th. In his second major league at bat that day, Votto hit his his first career home run. In only 24 games and 84 at-bats for the remainder of the year with Cincinnati, Votto hit .321 with 7 doubles 4 HR, and 17 RBI. He ended the season, securing his major league status, going 2-for-4 with a HR and 5 RBI in the Reds' final game of the 2007 season. Joey Votto didn't make the Opening Day roster on March 31st, 2008. Instead, he was to share time at first with veteran/mentor Scott Hatteberg, but that didn't last long. In early April manager Dusty Baker decided to begin playing Votto everyday at first base. During his rookie season with the Cincinnati Reds, Votto batted .297 in 144 games hitting 32 doubles and 24 HR quickly establishing himself as an everyday player in the Queen City. On May 7th, 2008 Votto hit three home runs against the Chicago Cubs. His 84 RBI in '08 broke Hall-of-Famer Frank Robinson's previous Reds' record (83 RBI in '56) for RBI by a rookie. Votto had his 2008 season further acknowledged by finishing second (behind Cub Geovany Soto) in NL Rookie of the Year voting. Prior to Votto's second major league season he played for Canada in the 2009 World Baseball Classic. Canada played only two games in the WBC, but Votto took advantage going 5-for-9 overall while doing most of his damage against team U.S.A. going 4-for-5 with a HR. In 2009 Joey Votto was the unanimous Opening Day first baseman for the Cincinnati Reds. He tore up major league pitching the beginning of the season hitting .378 through May, however, Votto was placed on the DL in early June after missing multiple starts in due to personal issues. Prior to returning to the team in July (after missing 21 games), Votto hesitantly informed overly curious fans, teammates, and media personnel about his depression and anxiety issues that kept him away from baseball resulting from the sudden death of his father in August 2008. After returning to the Reds, Votto finished the season among the NL leaders in average (.322), OBP (.414), and on-base-percentage (.567). After hitting 10 doubles during a span of five games (Sep. 21-27, '09) Votto was named MLB Player of the Week. The last player to accomplish that feat was Hall of Fame outfielder Paul Warner who did it for the Pirates, 77 years earlier, in 1932. Despite missing 31 overall games in '09, Votto still led the team in HRs (25), TB (266), 2B (38), Runs (82), average (.322) and BB(70). 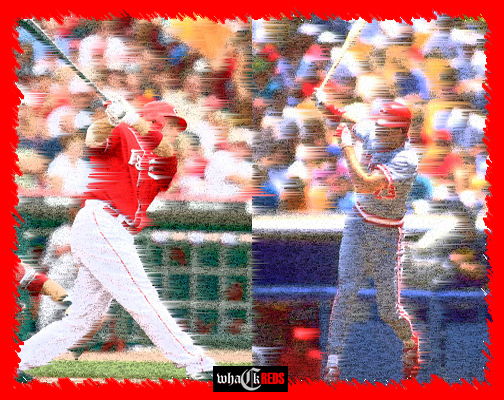 Joey Votto will continue to be one of the most feared hitters in the National League in 2010. He has been working extensively during the off-season on his defense. Votto has stated that he would like to improve his already solid fielding and win a NL Gold Glove to go with the one's that all of his surrounding infielders have. (Second baseman Brandon Phillips has one, shortstop Orland Cabrera has two, and third baseman Scott Rolen has seven.) He is the only member of the Reds' current infield without one. Joey Votto embodies professionalism. He mimics the the unique history and heritage of the Cincinnati Reds. He leads by example, he represents the quiet integrity of the game, and he is one of the game's current elite. If Joey Votto can consistently put up the numbers he did in his first two major league seasons and stay healthy, there is no question that he will someday become one of the game's greatest.